It’s great to think big with your New Year’s resolution, like saying you’ll pay off your student loans in 2019. But a goal that big often doesn’t even make it to the end of January. Instead of letting an unrealistic resolution frustrate you, focus on a small change that moves the needle for your student loans for 2019. That means taking the next step toward successful repayment, no matter your situation. Here’s how. You’re struggling only temporarily: Opt for a deferment or forbearance. These short-term options can help you through a rough patch, such as being unemployed. Deferment is preferable to forbearance, as interest won’t accrue on any subsidized federal loans you have. You don’t earn enough money, and maybe never will: Enroll in an income-driven repayment plan. These plans cap monthly payments to as little as 10% of your discretionary income, and payments can be as small as $0. Paying less now can increase how much you pay overall due to accrued interest. Income-driven repayment plans counteract that by forgiving your remaining balance after 20 or 25 years of payments. But if your earnings jump, your payments will too — potentially costing you those savings. So, this is a long-term strategy. Your next step: Contact your loan holder. You can apply for income-driven repayment or a postponement with them. Federal student loan borrowers are entitled to these options, but private lenders are more likely to offer only forbearance or deferment. Still, any of these actions is better than letting loans default. To repair your credit and save money: Rehabilitate your loans. Borrowers can do this by making nine voluntary, on-time payments over a 10-month period. The major benefits of rehabilitation: It wipes the default from your credit report and decreases collection costs you have to pay. But you can rehab loans only once, so make sure you’ll be able to repay after completing the process. To get out of default as quickly as possible: Consolidate. This option requires just three voluntary, on-time monthly payments in a row or agreeing to repay your loan under an income-driven repayment plan. Getting out of default faster lets you regain access to federal aid, if you want to re-enroll in school, or avoid other consequences of default. But consolidation doesn’t remove the default line from your credit report or reduce collection costs as much as rehabilitation does. Borrowers who default on private loans have fewer options; even so, your first call should be to the lender to see what it offers. Otherwise, the next step may be a debt collector or even a courtroom. Your next step: Don’t avoid your defaulted student loan. Borrowers often feel too worried or ashamed to reach out for help. But Mayotte says those anxieties are way worse than the actual call to your loan holder will be. If you’re comfortably making your student loan payments each month, see if it makes sense to pay more. This will depend on your debt management goals. You want those loans gone: Paying extra on student loans saves you money on interest and gets you out of debt faster. See just how far an extra $50 or $100 a month goes by using this student loan extra payments calculator. If you have good credit, look at refinancing your student loans at a lower interest rate as well. 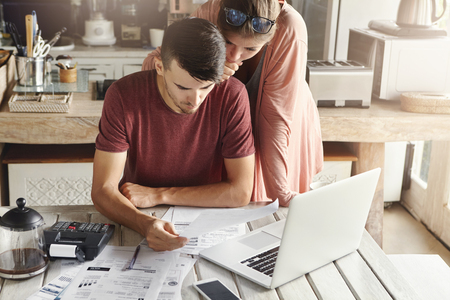 You want to best use your money: Mark Struthers, a certified financial planner at Minnesota-based Sona Financial, recommends prioritizing an emergency fund and retirement savings before prepaying student loans, as well as looking at your finances as a whole. For instance, he says, if you have a federal student loan at 3.5% interest, but a car loan or mortgage at 6%, paying off the higher-interest loan first could save you more money. In this instance, you should still continue making your minimum student loan payments. “It depends on the person,” says Struthers, noting that people often make student loan repayment decisions based on emotion instead of numbers. “You’re paying 2% more each year just to be done with that student loan.“ He advises borrowers to be aware of this trade-off. Your next step: Take a look at your finances overall before paying extra on your student loans. If you feel comfortable, put more money toward your loans. Just remember: Long-term financial health should be your highest priority. Ryan Lane is a writer at NerdWallet. Email: rlane@nerdwallet.com. The article Take the Next Step With Your Student Loans in 2019 originally appeared on NerdWallet.